A late strike from Lee MacDougall secured a deserved triumph for Thurso in Saturday’s PCT Cup final at Dudgeon Park, Brora. A low-key first half saw both sides under-perform in the second final of the MSIS North Caledonian season. It was the Ross outfit who went closest to scoring when Lewis Ross’s free-kick rebounded off the face of the cross-bar on 32 minutes. But Thurso took command after the interval with keeper Jack Mackay a bystander as his side went close on a handful of occasions before MacDougall’s clincher. The Vikings suffered a blow after 10 minutes when Willie Inrig was stretchered off after a clash with Ross which left him writhing in agony. The midfielder, a late call-up after a work commitment fell through, spent the night in Raigmore Hospital after being treated for a dislocated right elbow. The lengthy hold-up and the subsequent arrival of an ambulance inevitably affected the flow and tempo of the game. Thurso had made the more determined start before Inrig’s unfortunate exit. Alan Murray was inches away from connecting with an inswinging free-kick from Gavin Bremner and then went close with a dipping 25 yarder which flashed past the left upright. Balintore keeper Eddie Shearer was also required to dive low to his other post to clutch a free-kick zipped in by Nigel Mackenzie. After the stoppage, the chances continued to be manufactured at Shearer’s end . On 14 minutes, Murray sent Alan Sutherland racing through the middle with the keeper just beating him to the ball to make a solid block at the edge of the penalty box. Sutherland headed over a MacKenzie setpiece with Balintore’s first attack of any worth seeing James Skinner’s shot skimming across the face of Mackay’s goal after 27 minutes. Five minutes later, the Thurso keeper was powerless to prevent Ross’s free-kick swerve outside the phalanx of defenders in front of him and come back off the bar. Tony Farquhar was set to net the rebound but was ruled offside by referee Kenny Beats. With Kevin Morris and Brian Gray comfortably countering Balintore’s aerial threat, the near-miss from the free-kick was to prove Mackay’s only heart-stopper throughout the afternoon. MacKenzie spurned two clear opportunities to give Thurso an interval advantage. Ten minutes from the break, a clear corridor opened up for him down the left to home in on Shearer. But the winger took too long to weigh up his options, allowing the keeper to beat away his shot, with the ball sent into an upward spiral. Shearer recovered to foil MacKenzie’s attempt to head into the empty net and Phil Makhouli sent his follow-up shot past the post. After 41 minutes, MacDougall put MacKenzie away again but an action replay from Shearer saw the shot blocked, with Murray unable to convert the rebound. MacDougall was booked towards the end of the half following a spat with Ewan Dance; with Morris and Balintore’s Graeme MacGruer also yellow-carded. Makhouli, a lively presence throughout, was thwarted by the brilliance of Shearer from grabbing the opener four minutes after the turnaround. Makhouli’s fierce, driven effort from 12 yards produced a stunning, fingertip save to divert the ball over the bar. After 64 minutes, Makhouli instigated a move which ended with MacKenzie sent clear by Murray. Shearer once again came out on top in the duel though the keeper required the assistance of his defenders to complete the clearance. Balintore were focused on dogged defending as they sought to repel spells of intense pressure. Murray was unlucky with a lofted effort which drifted narowly wide of the target nine minutes before the belated breakthrough. The goal was created by Makhouli’s perseverance down the right flank. His surge took him past one defender and as he sought to wrongfoot a second, the ball broke across goal to Murray standing just outside the six yard box. With a defender in close attendance, Murray rolled the ball towards the unmarked MacDougall whose first-time, side-footed effort beat Shearer low at his right post. Balintore could have been expected to throw caution to the wind in the dying minutes but the cavalry charge never materialised as the Vikings’ dominance continued until the final whistle. 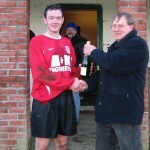 Bremner was named man-of-the-match before lifting the cup, which Thurso won three years ago. 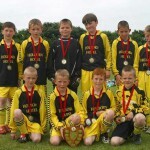 Balintore manager Alan Brindle afterwads had no excuses for his side, who he said had just failed to perform on the day. 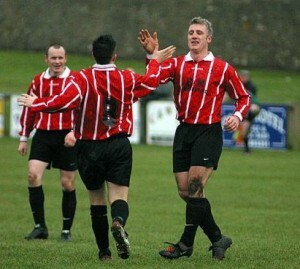 He said: “I thought the first half was fairly even but Thurso were well in charge thereafter. They definitely deserved to win on the back of their second half performance. “From our point of view, it was disappointing we could not get our passing game going. “All credit to Thurso who have run into a rich vein of form. If they had shown that earlier in the season, there’s no doubt they would be right up there challenging for the league.” The win extends the Midas touch of Thurso manager Duncan Gray who believes the victory was thoroughly deserved. He said: “The boys have been working very hard at training and they have been putting in a lot of very good performances. “I thought we were on top for most of the game and apart from the free-kick, I don’t think they really bothered us while we had quite a few chances. “But Balintore are a tough team to play against. They keep battling away and they have two or three players who are always likely to sneak a goal”. Inrig looks set to miss the rest of the campaign while Brian Gray is suspended for tomorrow’s home league clash against Bonar Bridge. Ross Sutherland was not used in the final because of a tight hamstring and is again a fitness doubt but Jamie MacKenzie could well return to the squad. Manager Gray accepts the league is now a lost cause but he is keen to extend his side’s unbeaten run. He said: “It’s important we keep up the momentum so we can take it into the two remaining cup competitions”. Thurso v Balintore: Mackay, Gray, Morris, Moar, Warner, A.Sutherland, Bremner, Inrig (Makhouli 13), MacKenzie, Murray (Cassidy 86), MacDougall. Sub (unused) — R. Sutherland.